We all want to save the world. But who is willing to pay the price? We all want to save the world. But who is willing to pay the price? Forced outside their village homes, the three chosen youth must find their way to Tzoladia along paths wrought with danger. All that was once safe has become perilous. Evil is on their trail. Amanki arrives in a city of islands which seems like paradise. But death rises from the mud. Moshoi weaves his way through caves and cliffs. But treachery lurks in the rocks. Brina’s flight passes through a lush green forest. But lethal secrets fill these trees. Will the star guide them to their destiny or lead them to their doom? Who will survive? Book two in this series is just as exciting and everything I hoped it would be! In Seekers, Amanki, Moshoi and Brina, continue on their journey to Tzoladia to unite under the guidance of their elder. Simple task right? Fate will not make this a simple journey for them as they are constantly tested with situations that make question the ideas they have grown up with and their own morals. Each character brings with them their unique upbringing and skills with the modifications that happened naturally to their bodies (learn more here). Amanki travels through what should feel like home to him with his web-footed people. What he finds is that the evil has touched them there too in the form of an evil priestess and royalty who serves themselves. He must do everything he can to protect and save the life of his friend and possibly the girl he has come to fall in love with? Brina finds herself caught in an extreme betrayal situation when they finally make it to the ship to learn that they have been sold. Moshoi, whose story I had a harder time to get into in book one, comes alive in this installment. His bravery and morals saves the lives of innocent people in neighbouring tribes. 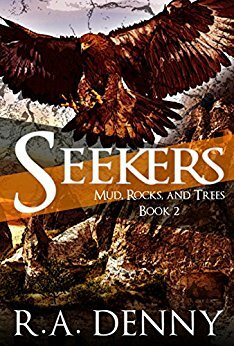 Seekers is a well written novel with an exciting plot. I found the plot exploded in this book and I did not want to put it down out of fear of missing what was going to happen next. The ending left me craving for more – what will our characters do in the face of such betrayal and evil?. It is perfect for both young adults and adults a like.